Use the MD Trading properties window to customize trading parameters for MD Trader. Displays the maximum order quantity permitted during trading. Note: To use MD Trader, this field must be greater than zero (0). Enables the Confirmation Order dialog, which will appear every time you place an order. Refer to Confirming Your Order in the Market Window. Replaces an existing Buy or Sell order, when you add a new one. Note: For BrokerTec products, the Leave order type overrides this property. Use 2nd default Qty: Submit a second default quantity in the Bid and Ask column at the price where you right-click. When using this option, you must type a quantity in the box to the right of the option. Changes quantity down with a left-click and up with a right-click. Amount: Sets how much a quantity changes with one click. 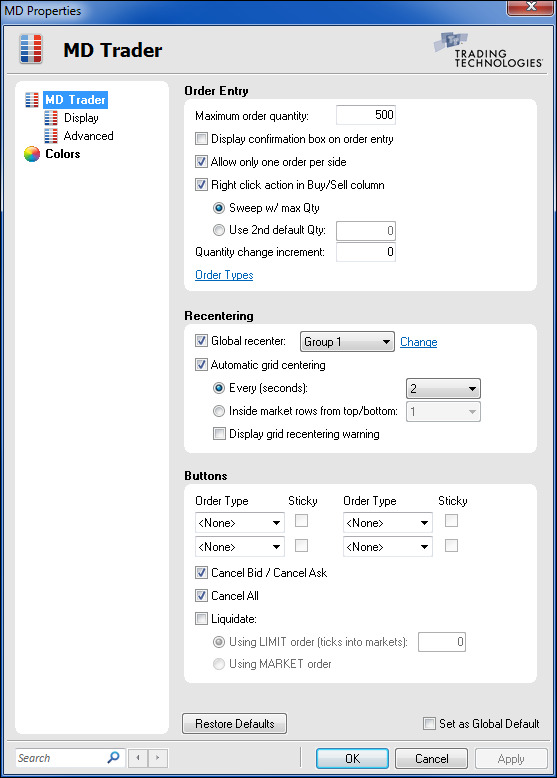 Used for assigning TT Gateway-supported order types to the Order Type Selection menu. Enables Market. Market orders cross the inside market to immediately fill. Enables Stop Market. Stops set the stop price for limit or market orders.X_TRADER supports Stop orders on all exchanges. A Stop Market order to buy becomes a market order when the futures contract trades (or is bid) at or above the Stop Price. A Stop Market order to sell becomes a market order when the futures contract trades (or is offered) at or below the Stop Price. Refer to Triggered Stop Orders. Enables Stop Limit. Stops set the stop price for limit or market orders. X_TRADER supports Stop orders on all exchanges. Enables Trailing Stop. Trailing Stop sets the price for a stop order a fixed distance from the current market price and moves dynamically. Trailing Stops can be limit or market orders. # ticks from last traded price: Sets the number of ticks from the LTP your order trails. Refer to Trailing Stop Orders. Enables Iceberg. Sends only a portion of the order quantity to the market at a time. Each order quantity is equal. When one portion fills, the next portion is sent until the entire order quantity fills. Default Disclosed Qty: Pre-sets disclosed quantity. Enables Immediate or Cancel. IOC Immediately fills the order to the extent possible and cancels the balance. Enables Fill or Kill. FOK immediately fills the entire order or immediately cancels the entire order. Enables Market Limit Market. MLM sets a buy order placed above the best offer to fill by the best offer, and a sell order placed below the best bid to fill by the best bid. Enables Minimum Volume. MV sets the minimum order quantity that must be available in the market or the entire order cancels. Keeps an order in the market until you cancel it or the contract expires. Note: TT User Setup credentials are required to use this TIF. Enables Limit On Open. LOO sets limit orders that only execute at the open. Any portion not filled at the open cancels. Enables Limit On Close. LOC sends Limit orders during the closing auction of the current business day. Any portion not filled at the close cancels. Enables If Touched. LIT submits the Limit order a set number of ticks away from the inside market and is activated when the market touches the price level. # ticks from stop entry price: Sets the number of ticks the limit price is from the entry price. Enables If Touched. MIT submits the Market order a set number of ticks away from the inside market and is activated when the market touches the price level. Enables Market to Limit. MTL send a Market order with the condition that on a partial fill, the remaining quantity rests as a Limit order at the price that was just hit or taken. Available on TOCOM, SGX, and OSE (J-Gate). Enables Limit to Market. LTM sets a limit order where any unfilled portion converts to a market order at the close. Enables Best Limit. BL lets you join the best bid or offer without entering a price. Available on TOCOM. Sets the order type the two orders in an OCO relationship follow. When one of the orders executes, the other cancels. Note: If your OCO gets partially filled, the second order is reduced by the quantity the first order was filled. Refer to Order Cancels Order. Sends orders which can only be filled by an Aggressive order. Note: This property enables by default. New and existing workspaces are automatically affected by the property. Recenters all MD Trader windows when you recenter one. You can disable this property for individual windows. Enables MD Trader to automatically recenter itself based upon the parameters you set. Sets the number of seconds before MD Trader automatically re-centers. Re-centers when the inside market is a set number of rows from the top or bottom of the grid. Flashes in MD Trader before it re-centers. Order Type Assigns buttons to order types enabled via the Order Types menu in the Order Entry pane. Lets you continuously execute the same order type without having to click the order type button again. The button and cursor highlight in yellow while the order type is in effect. To discontinue sending the same order type, click the selected button again or select another order type. Displays separate delete buttons for your working bids and offers. Displays a delete all button for clearing both your working bids and offers. Lets you flatten your position. Before MD Trader submits an offsetting order, it sends delete requests for all working orders for that contract. You need to send a second tradeout request if an existing working order is filled. Using LIMIT order: Indicates the tradeout method is by Limit order. You can also determine how many ticks you will trade out to flatten your position. Assigning a specific number of ticks ensures your order (once entered and not necessarily executed) is only a pre-determined distance from the inside market. When you click the TradeOut button, you enter a Limit order based on the current price. If the market moves and the offsetting price is not available, your Limit order remains working at the price you entered it. Note: This property does not guarantee your order will be executed because the market may move before you enter the order. Using MARKET order: Indicates the tradeout method is a Market order. When enabled, the (ticks into markets): field grays. When you click the TradeOut button, a market order seeks out the available offsetting order and executes against it.